Bikes parked outside of City Hall. This one, presumably, belonged to one of three-dozen deputants. The Bloor Street bike lane pilot proposal will go to Toronto city council next week. If approved the 2.5 km stretch of buffered bike lanes will be installed in late summer from Avenue Road to Shaw Street. On April 25, 2016, after more than five hours of debate and almost three dozen deputations - most in favour of the proposal - the city’s public works and infrastructure committee was split on endorsing the staff report. This means the pilot project proposal will now go to council without any recommendations from the committee and council will now debate the project, as opposed to simply voting on it. During the public works meeting, some committee members expressed concerns over unclear evaluation criteria and data gathering methods. In the end, committee chair Jaye Robinson (Ward 25, Don Valley West) and councillor Stephen Holyday (Ward 3, Etobicoke Centre) voted against councillor Anthony Perruzza’s (Ward 8, York West) motion supported by councillor Mary-Margaret McMahon (Ward 32, Beaches-East York) to recommend the report to council. Robinson also put forward a motion that would have made no recommendation, but instead would have tasked staff with providing additional information including research and evaluation data, and the costs of removing the pilot lanes. It too was defeated in a two-two split. As a result of the no-majority votes, the original report now goes to council without the committee’s stamp of approval. The result came after hours of presentations from residents, business owners, cycling advocates and students and others, on the proposed 2.5 km stretch between Avenue Road and Shaw Street in Wards 19 and 20. Even primary school students came out to support the pilot project. “Most of the time it's too scary for me to ride on Bloor Street because the cars take up all the road,” said Malina Fritz-Shwartz, who missed math class to speak at the meeting. Others recalled earlier fights to even study – let alone build – bike lanes along Bloor-Danforth. “Why are we talking about a pilot program 40 years into the study of the area?” asked Wayne Scott, founder of the Hoof and Cycle courier company. “Why is the consideration of motorists still holding sway over the other citizens of the city?” Indeed, sadly, one of the points of contention is loss of some of the on-street parking. Yet many businesses are in favour of the bike lane projet. Business representatives spoke in favour of conducting a study to gather more data. “The pilot is a necessary step,” said Brian Burchell, chair of the Bloor Annex Business Improvement Area. His group has partnered with the Toronto Centre for Active Transportation, the Metcalfe Foundation and the Koreatown BIA to study the economic impact of the proposed bike lanes. Another business owner argued that pitting cars against bikes ignores the fact that many drivers are also cyclists. “It isn’t like [we’re a] different species here,” said Howard Chang, president and CEO of Top Drawer Creative. Besides parking, emergency vehicle access could be a problem with reduced lanes for cars on Bloor, said Michael Remenyi, of the Remenyi House of Music store. “There should be streets that are not bike streets,” he said. Full houseL Public works committee hears deputations (photo by Robert Zaichkowski). Councillors intervened throughout the process. Robinson said she was worried about parking becoming a problem on smaller, quieter side streets. Holyday asked staff when and for how long they would be measuring traffic volumes. He also said he was worried that proponents were trying to build an “invisible wall” around the area – which would keep drivers out of the core. 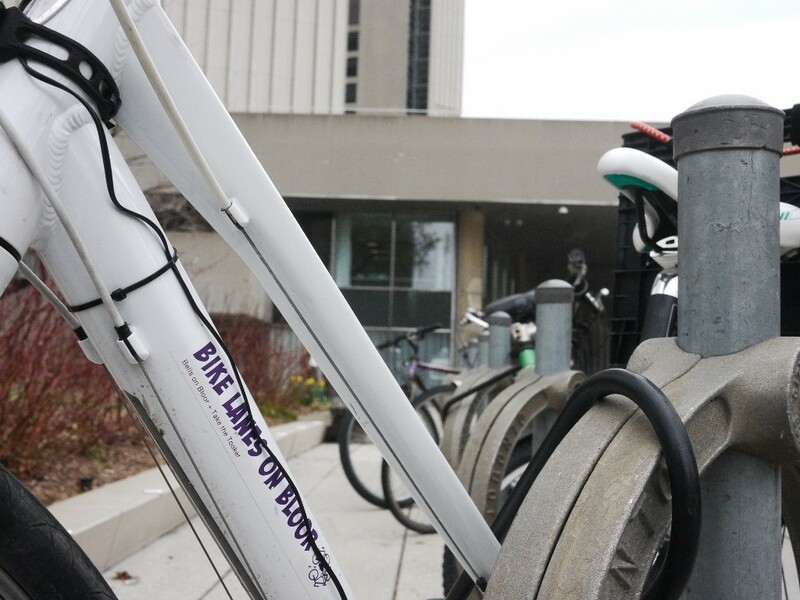 Despite the stalemate over the much-anticipated Bloor bike lane pilot project, the public works committee did endorse installing a few very short bike lanes on a number of city streets, including Argyle Street, Dundas Street West, Havelock Street and Logan Avenue, among others at this meeting. The city’s plan is to extend existing bike lanes and convert edge lines to bike lanes, as well as creating a few new lanes, some of them contraflow, this year. The committee also agreed to call upon the federal Minister of Infrastructure and Communities to fund active transportation projects in Toronto, such as the West Toronto Railpath and the East Don Trail. At a press conference following the Bloor pilot project decision (or “non-decision” one might say), councillor Joe Cressy (Ward 20, Trinity-Spadina) said he was confident council would endorse the project at its next meeting. 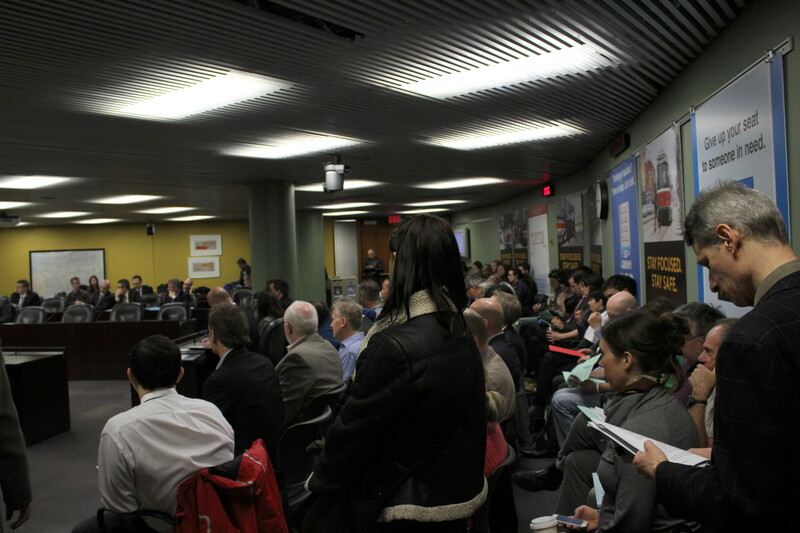 Although not committee members, Cressy and councillor Mike Layton (Ward 19, Trinity-Spadina) spoke in favour of the project during the meeting and are both bike-friendly councillors. The mayor finally went on record in support of the long-fought-for bike lane project today, but underlined the fact that his support is contingent on the pilot being thoroughly studied from all standpoints. Council with debate the project next week.